It's year three at Hogwarts, and Harry Potter and all his friends are back for another year of magic and mayhem. The main difference this time is that Mexican director Alfonso Cuaron (Y Tu Mama Tambien, Great Expectations) is helming the film instead of Chris Columbus (who still remains an executive producer). Cuaron is best known for the raunchy Y Tu Mama Tambien, but also made the excellent (but nearly ignored) children's film A Little Princess. The difference is notable. Columbus is a capable director. He makes films that appeal to everybody, but does not have a distinctive voice. Cuaron is an auteur, and his visual style and impression are immediately felt. 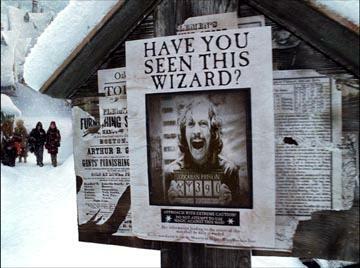 The Prisoner of Azkaban has the feeling of magic that the first to Potter films are missing. Harry (Daniel Radcliffe, Harry Potter and the Chamber of Secrets, Harry Potter and the Sorcerer's Stone) is maturing, and beginning to manifest lots of anger. Cuaron's vision of J.K. Rowling's world is more magical, but is also darker and more dangerous, matching a subtle shift in the tone of the series. Steve Kloves, who adapted the first two novels, is back again, as is pretty much all of the principal cast. The weak point in Azkaban is that there is a lot of story to cram into one film, and Kloves tries to put it all in. Characters appear very briefly for no other reason than to appear. And while this film spends less time setting things up, it still does take a while for the story to get moving. It finally hits its stride in the second half, when all the elements are in place and the story rockets to its conclusion. Radcliffe and co-stars Rupert Grint (Harry Potter and the Chamber of Secrets, Thunderpants) and Emma Watson (Harry Potter and the Chamber of Secrets, Harry Potter and the Sorcerer's Stone) are all aging well, and act more comfortable in their roles. And the series continues to cast some of the best British actors around. This time, a wonderful Gary Oldman (Hannibal, The Contender), Michael Gambon (Sylvia, Open Range), Emma Thompson (Love Actually, Treasure Planet), and David Thewlis (Timeline, Goodbye Charlie Bright) join the cast, while Julie Christie (Troy, No Such Thing) and Timothy Spall (The Last Samurai, Nicholas Nickleby) have smaller roles. Gambon replaces the late Richard Harris as Dumbledore, and looks remarkably similar. However, rather than trying to imitate the grace of Harris, he infuses Dumbledore with a streak of mischief and a wry sense of humor. Sirius Black (Oldman), a ruthless murderer, has escaped from Azkaban prison. He is the first person to do so, and is especially dangerous to Harry because he is the one who betrayed Harry's parents to Voldemort. To protect Harry, imposing, wraith-like Dementors, the Azkaban guards, are sent to protect Hogwarts and Harry. However, they seem to have the same effect on Harry as they are supposed to have on Black. Professor Lupin (Thewlis) is the newest teacher in Defense Against the Dark Arts (not the best job to have given the last two films) and Harry goes to him for help and guidance. People are hiding Black's connection to Harry, and the more that he discovers, the more he wants to confront Black. Cuaron was just what the franchise needed to stay fresh. 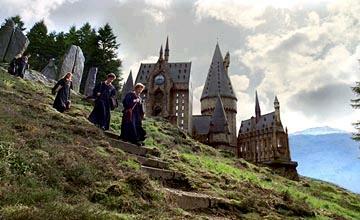 It doesn't matter that Hogwarts looks different than it did in the first two films. It does matter that it looks more otherworldly. The spires reach higher, and seem less symmetric and more random. The hallways are darker, and the recurring theme of giant clocks seem remind everybody of mortality. It always seems to be raining or overcast, which again ties into the darker mood of Azkaban. Cuaron also made the decision to have the children wear normal clothes in addition to their robes. It seems to be a small decision, but the kids look more like ordinary, everyday kids than wizards-in-training. And although it's only been three years since the first film, it is easy to see how far the special effects have come. Cuaron has the camera back up through glass windows, and creates an extremely life-like animal that is the cross between a horse and a hawk. If not for the slow start, Harry Potter and the Prisoner of Azkaban would easily be the best of the series because it is the most complex. Watching all three films, one can see that the characters are not only aging physically, but becoming more mature. And with this maturity in the characters comes a welcome maturation in style. So far, Cuaron is only on board for this film. The next director for the series is Mike Newell (Mona Lisa Smile, Pushing Tin). With three more books after that, here's hoping that Cuaron returns for at least one. 2 hours, 19 minutes, Rated PG for frightening moments, creature violence, and language.